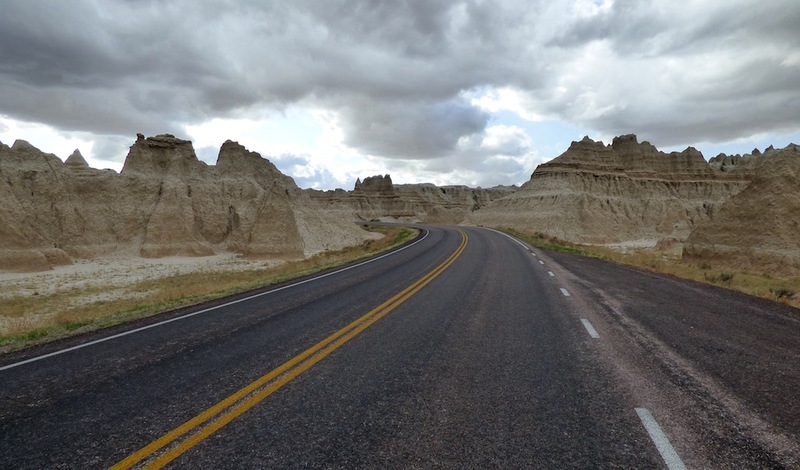 Hail splattered loudly against my Ford Explorer’s roof as we turned off the nearly empty South Dakota highway and began following a desolate side road, passing an iconically shaped sign announcing that we were entering Badlands National Park. The flat, low clouds that had been floating casually over the endless grasslands had suddenly darkened and gathered with purpose over the park entrance, greeting us with perfectly timed hostility. 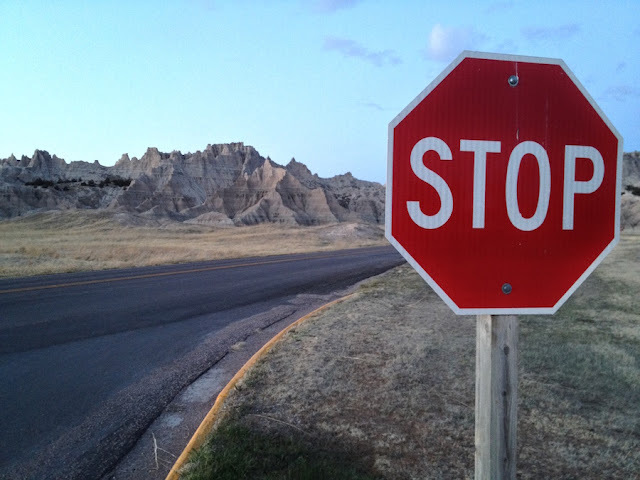 We had driven for two days, leaving Michigan and driving through Indiana, Illinois, Iowa, and a lengthy stretch of South Dakota, to reach Badlands. 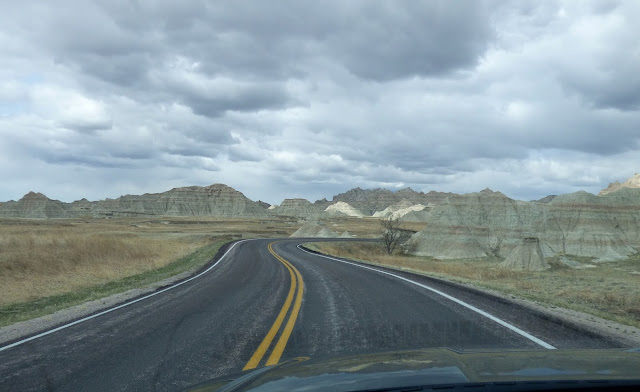 I had been in the mood for a road trip and some car-camping, which we hadn’t done in quite a while, and I had wanted to visit Badlands for a long time, particularly since my sister’s impromptu trip there five years before. 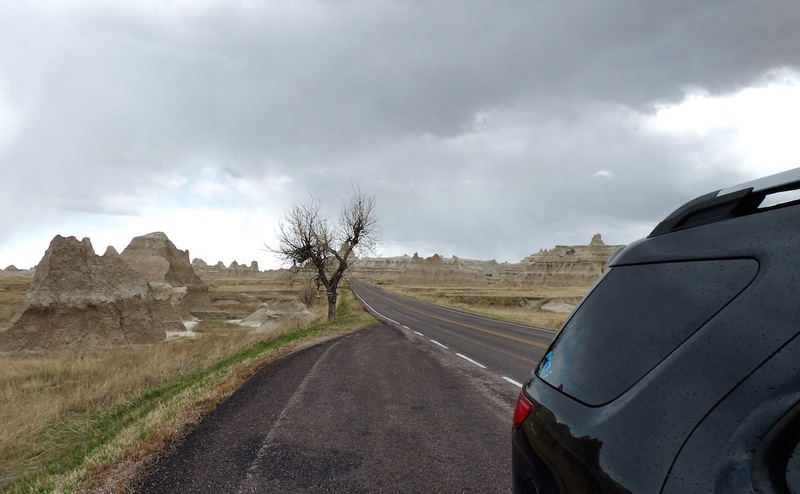 She had driven to Chicago to visit friends and ended up in South Dakota on a whim. The photographs she returned with were otherworldly and incredible, and Badlands jumped several spots on my list of places to visit in the near future. Now, revisiting my own photographs and videos, seeing the alien landscape and hearing its sounds, has me wanting to return. It is one of the most unusual and striking places I’ve ever visited. And definitely the weirdest. Spectral stagecoach and a human skeleton walking a T-Rex skeleton. The usual stuff. The car strategically packed with backpacks, hiking boots, camping gear, and far more food than was necessary, we set off on the 18-hour journey on a Saturday in late-April. The plan was to stop at the mid-point—about halfway through Iowa—for the first night, but we decided to roll the dice with accommodations. We did not have a specific destination in mind; we would either find a place to camp, or stay in a motel depending on how we felt and what we found. 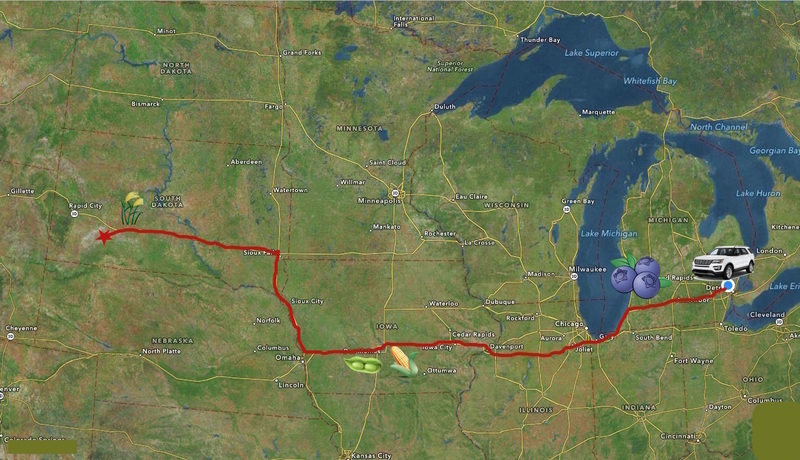 Driving long stretches across the American Midwest is a torturous combination of the fascinating and mundane. As anywhere, there are stretches that are beautiful and depressing, exciting and monotonous. One’s opinion of an entire state can be formed by driving through it on a highway, which can sometimes be unfortunate. Take Iowa: Interstates lead travelers through endless stretches of flat, unvaried farmland, which makes for a long and tedious drive. I have heard tales of the state’s beautiful sights, but I have never seen one. Magnificent countryside no doubt exists off the beaten path, beyond the seemingly infinite rows of corn and soybeans, and off the radar of out-of-state drivers who are passing through. Or not. Still, road trips are fun. The strategic music selections. The rest areas, gas stations, and terrible coffee. The excitement of crossing into a new state, even if it’s no different than the one before. The temptation to keep driving and not go back. We reached Des Moines and called it a day. After a few minutes of driving around the city and looking for places to eat, we found ourselves at The Royal Mile, a British-style pub and a good find for weary travelers in need of food and a little Jameson. 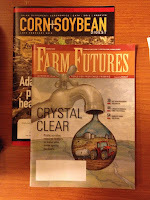 After dinner, we ventured west of the city and found a small, inexpensive motel in De Soto. The motel was clearly empty; not a single car was parked in the lot, and the vacancy sign glowed from its front window. Despite this, when we inquired about a room, the man in overalls working at the desk made a big production of checking to see if there was anything available. After crossing the room to study a small corkboard with various hand-written notes stuck to it, he returned to the desk, opened a drawer that we could see was filled with keys to every single empty room, and rummaged around in it, murmuring to himself thoughtfully. The anticipation was intense; we really hoped he could help us out. Finally he decided he had a room for us, and handed us a form to complete. He asked if we’d eaten and advised that, aside from the gas station/food mart next door, our options were an “authentic Mexican restaurant” in one direction, “but if you go the other way—nothin’!” He said this with a chuckle and a facial expression that said, “Iowa, am I right? !” and we decided we liked him despite his earlier deception. The following morning we continued heading west into thick fog. As unfortunate as it normally is to have to drive in those conditions, the fog was a welcome (hindrance to) sight because it lent a little mystery to the otherwise mind-numbing, seemingly endless drive through Iowa. 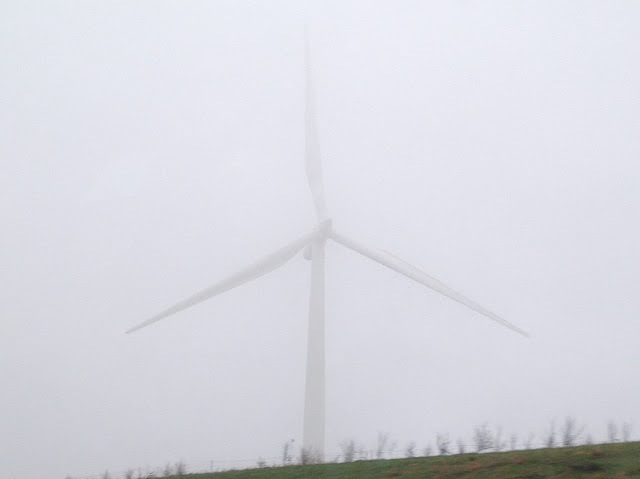 One-by-one, massive wind turbines slowly emerged from the fog as we drove, their tall, ghostly white pillars invisible until we passed close enough to them to discern their towering shapes from the fog. These were bigger than the turbines I’m used to seeing near home, and their eeriness was transfixing; they appeared like giant, murky phantoms, their enormous blades turning in slow-motion. None of the photos I took of them from the passenger window of the moving car came close to capturing their scale or creepiness. 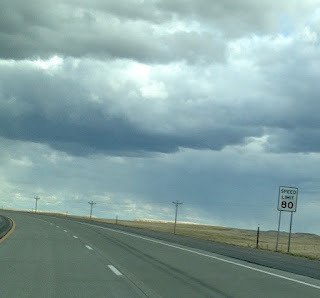 The fog lifted later in the morning, and our anxiousness to reach the South Dakota border increased with every mile. The sights in the next state would be unchanged for a while before the landscape began to transform, but at least we would be in a state neither of us had seen before, and at some point the speed limit would increase to 80 mph, which was something to look forward to. We abruptly turned north at the Iowa-Nebraska border, skirting the state line until the three states converge at Sioux City along the Missouri River. We crossed the river on a bridge and continued north into South Dakota, stopping in Sioux Falls for lunch at Phillips Avenue Diner. 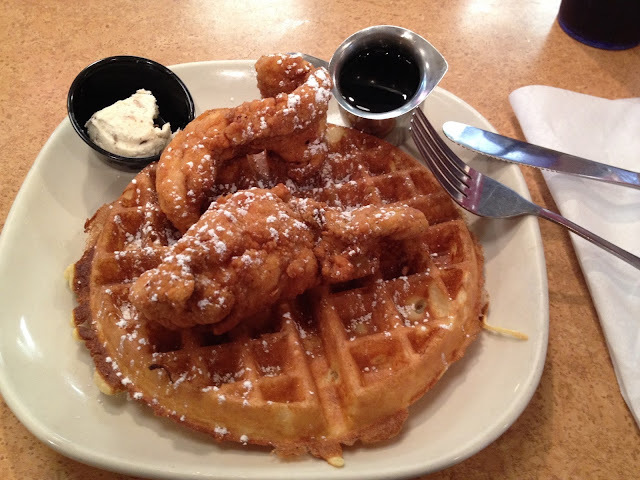 I ordered a Coke with the Chicken and Waffles and hadn't taken 3 sips before a new one was plopped down in front of me. There are 2 gigantic, full Cokes just out of frame. 'Merica. From Sioux Falls we headed west to begin the long stretch across the state to Badlands National Park. 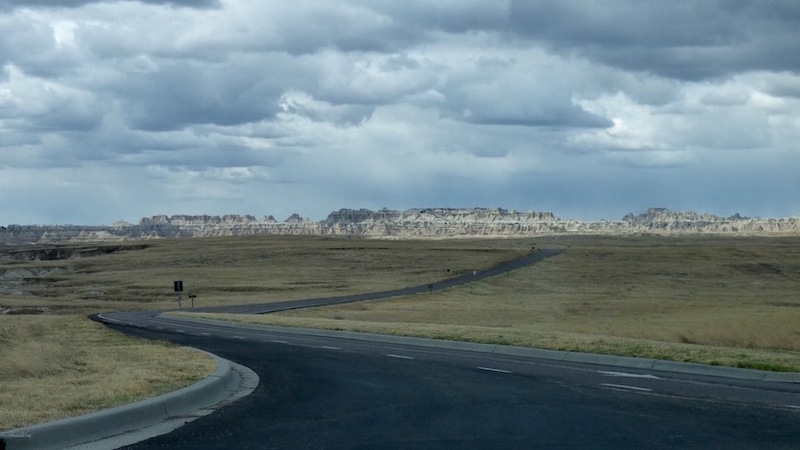 The further west we drove, the more open the landscape became. 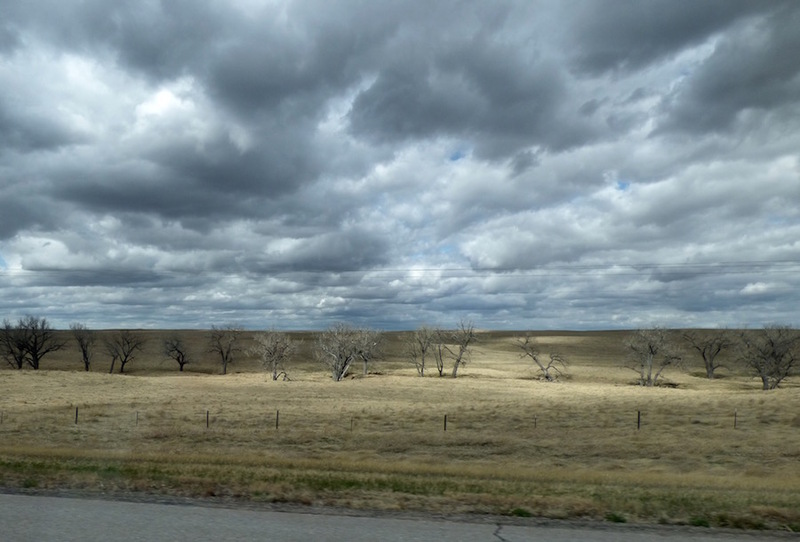 Farms were replaced by vast grasslands, and the sky seemed to expand, making it obvious why parts west are referred to as “big sky country.” Vastly different than looking up at the sky in Michigan, out there the fact that the limitless sky stretches for an infinite distance is somehow more plain to see. Everything is big and open and exposed, projecting a sense of the magnitude of our country’s landscape—of how immense it is and how small we are. We drove at a liberating and legal 80 mph through the sweeping South Dakota grasslands, watching as the sky became increasingly cloudy, with shafts of sunlight breaking through in patches and casting cold light on the earth below. At long last, we spotted the first in an endless series of signs advertising the infamous Wall Drug, which meant we were getting close. (...ish. The signs begin beckoning travelers very early, and they go on and on to a comical extent.) I don’t remember exactly where, but a billboard in a small town advertises the last chance to obtain gasoline for a very long stretch. It is not exaggerating, and I advise heeding its warning and stopping for gas if there is any doubt. After this it’s a barren, Mad Max-esque landscape with no gas station, restaurant, or rest area in sight for a seemingly infinite stretch of highway. 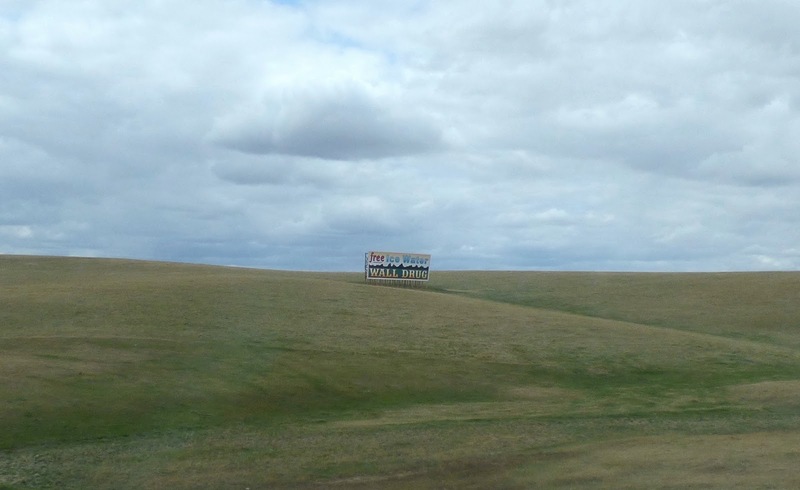 Nothing but road and sky and Wall Drug signs increasing in frequency and steadily convincing you of your interest in cowboy boots and donuts. Then suddenly: a jagged rock formation in the distance! We had arrived. 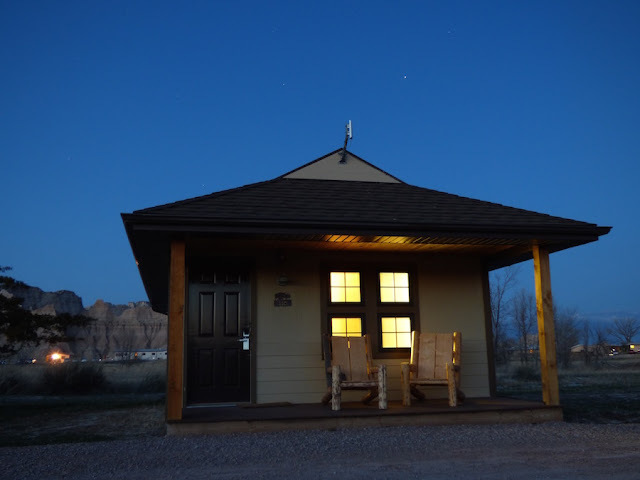 Our plan was to spend the first night in Badlands at Cedar Pass Lodge, a cluster of cabins within the park. After that we were going to camp in our tent at either the Cedar Pass or Sage Creek campground, or a combination of both. It was a little early to check in at the lodge, so we decided to visit Wall Drug first, which is about five miles north of the park. Wall Drug is a must-see, simply because it is a paragon of Americana. We bought ice cream and walked around the various shops, browsing the souvenirs and taking everything in before getting back on the road and heading back to the park. Regarding the weather: Since the beginning of the cross-state drive from Sioux Falls, the wind had been positively brutal. Without exaggeration, I would estimate its velocity at around 700 mph. I expected windy conditions in this part of the country; however, this was far beyond anything I had imagined. My Explorer lurched from side-to-side on the highway from the force of the wind. The wind tore the heavy car door out of my hand when I opened it, and I struggled to get it closed again against the wind that wanted to force it to remain open. It was like being in a cartoon and struggling against an extreme force in order to do the simplest of things. For most of the day the sun shone brightly in the sky, but the wind cancelled its warmth. I researched the local weather during the planning of this trip. I'm not a big fan of hot summer weather, and the majority of places that interest me tend to be cold; however, I had experienced my share of frigid vacations over the last several years and wanted a change. Although the park’s weather can be unpredictable, late-April seemed like a good time to avoid both crowds and temperature extremes. 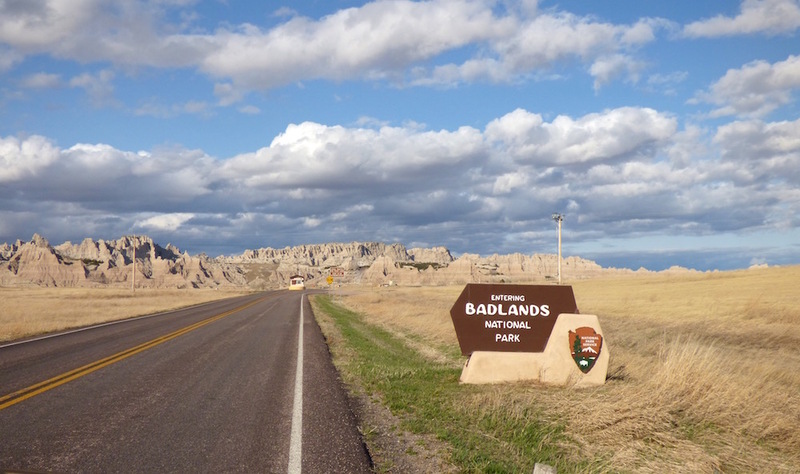 When my sister visited Badlands a few years ago, she went in mid-May, and the weather was hot. Her photos showed desert flowers blooming colorfully, and rattlesnakes warming themselves in the sun along hiking trails. Based on this and a review of the weather information posted at the National Park Service website for the park, it appeared the weather in late-April would be mild, with highs in the upper 60s, and lows around 40. A check of the forecast before we left indicated we would have temperatures in the 50s and 60s, but we packed clothing for all types of weather to be safe. I think it’s obvious where this is going. My excitement built as we turned south onto SD-240 and made our way toward the northeast entrance of the park, closing in on the jagged formations we had spotted in the distance earlier. The sky had steadily darkened since we left Wall Drug, and as we passed the welcoming NPS sign, a sudden hailstorm exploded over us. Slowing down to a crawl due to lack of visibility, we marveled at the scenery and the volatile weather. It was like we were on Mars, and the angry planet was letting us know we were not welcome. 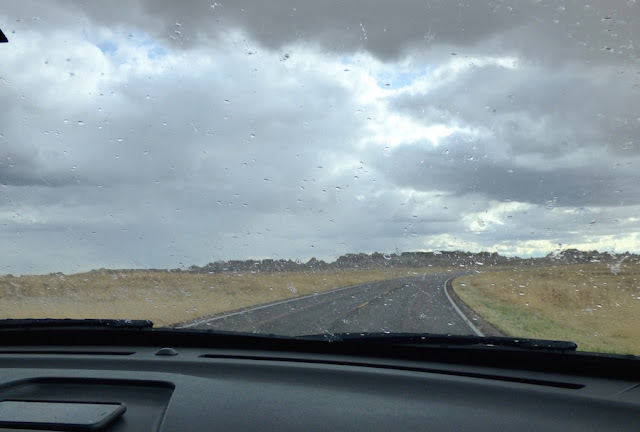 Luckily the hail did not last more than a few minutes; we paid the park entrance fee, and a park map was passed between the kiosk and my car’s open window, hands grasping it in a death grip against the relentless wind. 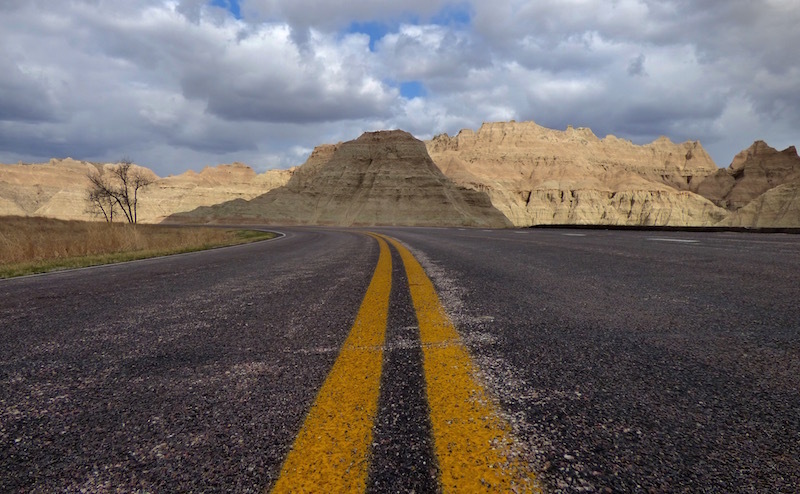 The sun worked its way through breaks in the clouds as we drove toward the Cedar Pass area on the winding Badlands Loop Road, with spectacular scenery all around us. We didn’t get far into the park before we pulled over and got out of the car, simply because we were amazed and wanted to stand and stare. It was the most unusual place either of us had ever seen. It was like the set of a movie that takes place on another planet—but a low-budget movie, where the backdrop looks fake. I was in love. Stopping to stare. Were we really here? There were no other cars on the road, and the park appeared deserted as we pulled into the Cedar Pass Lodge parking lot. We would soon learn that April is not a popular time to visit the park. Upon check-in, we noticed a posting of the updated weather forecast for the upcoming week. It was not good: wind, and lows in the mid-20s. We planned to spend four nights in the park. Aside from this first night in a Cedar Pass cabin, we intended to camp during the rest of our stay. Camping in the cold is one thing, but camping with lows in the mid-20s combined with the vicious winds we had been experiencing was not a pleasant thought. Would we be able to spend any time outside at our campsite, or would we be confined to our tent, with the relentless wind beating against it? Would we be able to cook anything in that wind? Would we be able to sleep? Would our tent collapse? With these thoughts in mind, we inquired regarding cabin availability over the coming days, just in case. The lodge employee who checked us in was genuinely surprised when we told her how many days we planned to spend in the park. Her response was something like, “Four nights? Here? The whole time?” We did plan to spend one day outside of the park, but yes, that was our plan, and we were starting to wonder if there was something we were missing, like a planned nuclear test or well-known ancient curse that we had somehow overlooked during trip planning. We drove to our cabin to settle in and decide what to do for dinner. The lodge has a restaurant, but we also had a car filled with food, so our options were endless, provided we stuck to those two things. 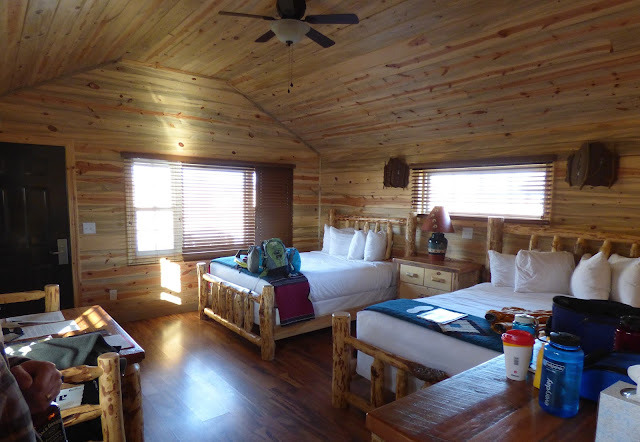 The cabins at Cedar Pass are fairly new, and they are simple and beautiful inside. 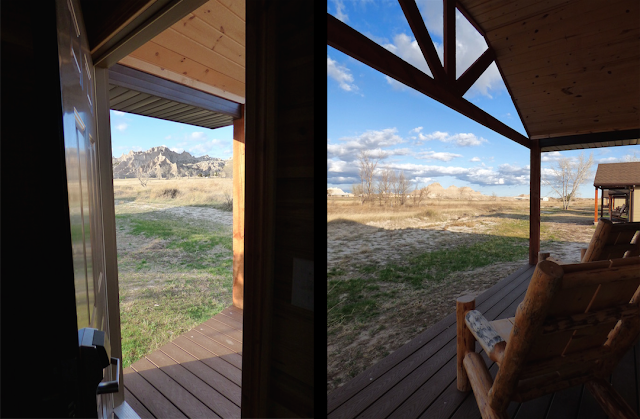 We had a view of some Badlands formations from the back porch, which faced the area where the Ben Reifel Visitor Center sits. The weather had cleared up, and fluffy white clouds now drifted in the brilliant blue sky. It had turned into a beautiful day despite the cold and wind. There is a convenience store and two small bars nearby, but nothing else. We decided to make hotdogs at the cabin, and we drove to the store to pick up a few items we did not bring, namely alcoholic beverages and mustard, which I had somehow forgotten. The woman working at the convenience store found us fascinating. She asked what we were doing in the area, and when we replied that we were visiting the park, she did not hide how weird she thought that was before pointing me in the direction of the store's single jar of mustard. When I returned to pay, she seemed as though she was really trying to suppress further scrutiny but just could not let us go without further clarification. As I turned to leave, she said, “Ok, I’m going to be nosey. Where are you staying around here?” It was as if there wasn’t a national park down the street. I explained that we were staying in the park and planned to do some camping, which I assumed was reasonable, but was clearly mistaken. “In the park?” She chuckled and said something about different people liking different things. Where were we? We returned to our cabin, and after struggling against the wind to bring some of our stuff inside, we held a meeting over a few pours of whiskey at the hand-hewn pine table. Camping was going to be miserable if this weather continued, which it evidently intended to do. Although I had very much been looking forward to some quality tent time, I also wanted to enjoy my vacation, and I had to admit defeat. We decided to stay in the cabin for the duration, and we returned to the office to blow their minds with our declaration of setting up shop in their establishment for the next few nights. Aside from one other guest who was leaving in the morning, we were the only ones there, so availability was not an issue. We were henceforth “the ones who are staying here,” said in hushed voices whenever we were spotted. As odd as this all was, it made a little more sense over the following days as we had the park almost to ourselves, and the cold and wind persisted. It appeared people don’t really start visiting Badlands until May, and those we did see during our stay seemed to be taking in the park via one scenic drive as they passed through to somewhere else. After a fabulous hotdog dinner and a little more whiskey, I ventured out to explore our surroundings. Dusk was just beginning to settle in, the sky turning a soft purple behind the various peaks and spires. Unfamiliar and beautiful birdsong filled the air, and I searched until I found the source: a western meadowlark. I grew to love its song, and it’s one of my fondest memories of the trip. I walked around for an hour or so before returning to our cabin for the night. The wind calmed down in the evenings, but during each day it was ferocious, preventing us from sitting outside at our cabin despite how sunny and inviting the outdoors looked from our window. But in the plus column, having the park to ourselves made for some relaxed scenic drives, and we were able to see everything at our leisure, stopping whenever we wanted a closer look at something, without having to worry about holding up traffic. It also meant virtually no one else on the hiking trails, which was a bonus. 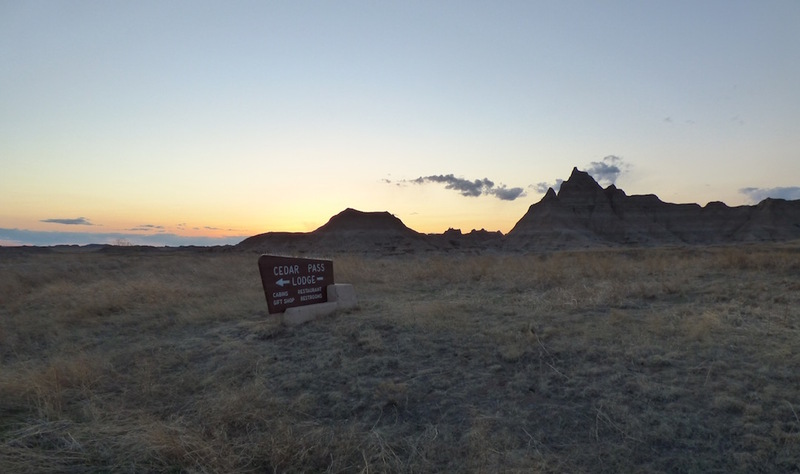 I thoroughly enjoyed my visit to Badlands National Park, but when I hear about the unseasonably warm temperatures of the current winter season and see photos on social media of park visitors wearing t-shirts in February, I can’t help but want a do-over. 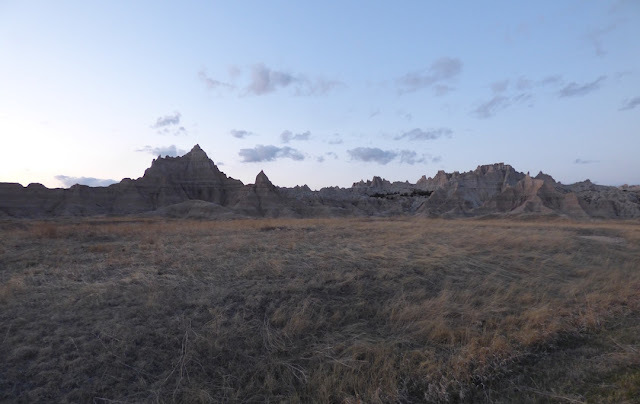 A video of the Cedar Pass area at dusk can be seen here. I love your writing! I found this very entertaining. Looking forward to hearing about the rest of your trip! Thanks so much Kerry! I'm glad you enjoyed reading it. Hopefully I'll get the next part up soon. I so love to read of your hiking trips. It is because of you that we have been in many cabins in the Porkies and now spend every year at the Union River Cabin in the Porkies for Thanksgiving with my kids and grandkids! We have traveled extensively to SD as my in-laws live in Rapid City. Next time you drive you have to head west on 12 out of Sioux City then 18 to Winner SD then 44. You won't be disappointed :)the Missouri River breaks are awesome!! Were the cabins reasonably priced? Thanks for reading. When we stayed there they were $157/night, but it looks like they've gone up since then.